I met Eugene Ohu last October in the Lagos Business School, Nigeria. 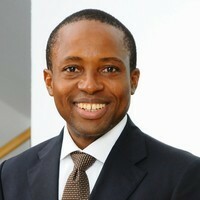 He is a member of Faculty in the Lagos Business School, Nigeria where he teaches the full-time MBA, Executive MBA (EMBA), Modular Executive MBA (MEMBA), Management Communication and Organizational Behaviour. He also facilitates sessions in other executive programmes for CEOs and Senior Management on Digital/Mobile Marketing, Digital Human Resource Management, Corporate Communication, Media Relations and Strategic Customer Relationship Management. As a specialist in cross-cultural management and communication, I asked him to explain how he perceived Nigerian culture and management culture in Nigeria. E-&-S: What characterizes, according to you, Nigerian mentality? E. Ohu: The way one asks for permission can show up some differences between Europeans and Africans. Ok, I don’t like speaking of « African » as if Africa was a single country. One difference I see between some Europeans and some Nigerians is that the former are more refined, respectful and delicate about issues of privacy, they are more likely to ask you for permission before they do things. As a Nigerian however, once I perceive that you already show respect for my privacy, I am comfortable enough to tell you whatever you wish to know. If you explain briefly why you want to do something : ask me personal questions for example, that is OK, but if despite my assurances you continue to try to explain yourself, I might consider it a too exaggerated attempt to respect my privacy. That’s a paradox because the same Nigerians who might think you exaggerate will be offended if you don’t do it ! I appreciate that I am being respected but after some time I may become embarrassed on your behalf if you make too much effort to explain, I begin to have pity on you. Nigerians are a very welcoming people. You only notice that when you come to Nigeria. You get to know this only when you come close to them. They do their best to make you feel welcome if they realize that you look lost as a foreigner. They want to help you to settle down. For example, when Nigerians are driving along the road in Lagos, if they notice that a European or a non-Nigerian is stopped by the police who is attempting to extort money from the hapless driver, one would occasionally see a Nigerian stop and tell the policeman, « please let him go ». Why ? Because they want that person to feel welcome. And they know that this action from the policeman is not welcoming. I have done it too. I am very happy when I see a European driving himself or herself in Lagos. It consoles me that there is someone who is confortable enough, safe enough to do this. I feel a sense of protection towards that person. I know many people who share the same sentiment. E-&-S: What do you enjoy or dislike when working with Nigerians? E. Ohu: Aggression: I think some Nigerians may be too aggressive. Sometimes when they make requests, I get the impression there could be some psychological violence or « verbal aggression ». The same can be observed in interpersonal relationships where I think we could be more refined and delicate. I think we argue too much. One thing I find interesting in a country like Spain is that you can sit with people talking together and giving your opinions and everybody listens to the opinions of the others. They have different opinions but they don’t give the impression that they are fighting. On the contrary, in a setting where some Nigerians may be expressing different opinions, they may not be fighting but if you listen in as an outsider you may think they are quarelling because they don’t give room for other possibilities. I believe we need to be more open. E-&-S : You mean people want to say their word first and they don’t take time to listen to others ? « I don’t believe in climate change ». And if you ask me, « why don’t you believe in climate change ? » I may answer : « I have nothing to say about it », I don’t want to be threatened. Keeping face is one reason why we don’t listen to the others. E-&-S : are you very proud people ? E.Ohu : A proud people: Yes, we are, it is a good quality but we are afraid of being vulnerable. That vulnerability may be linked to a lack of education, a lack of knowledge. For example in a public university, the typical Nigerian professor does not want to be challenged in class by fear that someone would reveal his ignorance. He is supposed to be the master so he cannot make a mistake ! If you challenge me with another point of view, and if I admit your point of view as a possibility, I might hence expose my ignorance, so I don’t listen to you and I tell you : « I am the master and you listen to me ! ». The teacher is not supposed to be a learner as he is supposed to know everything. When this attitude is taken into the business environment you can imagine how damaging it can be. Pride can be a good thing but arrogance never. No dichotomy between work and family: On the positive side, what I like when working with Nigerians, I think that the typical Nigerian wants the work environment to be like the family environment, they do not like the total separation between work and family. Nigerians are concerned about the family lives of their colleagues. They do not say leave your wife and children at home, leave your problems there, I think it is good because we play different roles as individuals, as an employee, as a father, as a mother... The life I have at home affects my performance at work and the other way round. If you tell me to establish a strict dichotomy between the two domains, I think you are doing something very artificial. Nigerians do not like this type of division because they want to be real and be the same person everywhere. As we are family oriented, we like that our bosses recognize the other roles we play. E-&-S: Could you name a few similarities shared between Nigerians and other African countries? E.Ohu: I can compare with Kenya as I have been there a few times : as for similarities : they love family and extended family but also every African child is the child of every woman in the village. If my mother, for instance, sees your daughter outside doing something wrong, she will not ask your permission to correct her, she will correct her like her daughter. Children are very important, Africans love children, the more the better. Why is it so ? African families might be poor but they feel the need to share. Differences : Kenyans sometimes describe Nigerians are being « too loud » (big laugh), a reference to their boisterousness. When I travelled to Tanzania, it was funny to hear Tanzanians describe Kenyans in much the same way – they think Kenyans are too aggressive. (By the way, Kenyans describe Tanzanians as being « too slow »). I do agree with the Kenyans that Nigerians are « too loud ». You may be able to explain the timidity of Tanzanians. Their official language is Kiswahili and they barely speak English. Julius Nyerere, who ruled the country for many years and was their main champion for independence sort of « locked » the country up culturally in a bid to « protect » its traditions. One may perhaps trace the lack of exposure and education of Tanzanians to some of these actions. Kenyans also speak Kiswahili but English as well. If Nigerians are more aggressive, they are also more daring, it is not surprising that the biggest economy in Africa is in Nigeria, they take more business risks. When you see issues of xenophobia of some South-Africans against Nigerians, one of the reasons may be because Nigerians are aggressive in seeing and pursuing business opportunities which takes into many African countries. The locals they meet there naturally feel threatened. This so-called « aggression » of Nigerians can actually be an expression of their entrepreneurial spirit but other African countries call it « aggression ». By the way, Nigerians think that Kenyans are too slow (laugh). E-&-S: What seems, according to you, Nigerian relationship to time? E.Ohu: With respect to past, present and future, I think we give importance to the past, especially because of the African’s recognition of tradition which influences what becomes our culture, the way you, the ancestors did it in the past. Africans have a sense of history, you learn from the past, you do not repeat your mistakes, you know how it was done, you know the values that are expected of you and you act accordingly. Nigerians have a natural tendency to prefer things in the traditional, keeping it stable rather than trying out too many uncertain innovations. However, I also think we give importance to the present and to the future. In terms of time management, priorities, we give more importance to the present because there are immediate needs to take care of, related to physiological needs which must be solved now, needs that may be related to the lack of resources or to poverty. Where many Europeans have higher needs, more psychological needs, most Africans have physiological needs to be solved in the present. If I consider that I am an individual working as my own boss, I will be task and result oriented as these tasks will give me the immediate results I want. If I consider I am a member of a team, I am not interested in the results but well in the tasks I have been given because these tasks will give me an immediate reward. I have physiological needs to fulfill. I am not interested in the global view. As a team member, I am more in the present than in the future because future is too far. Nigerians usually think more for themselves, they are more selfish, they try to solve their problems on their own. As a boss, I do not know how long I will stay in this position as I may be removed sooner or later, so I need to protect my position. We assume tasks and achieve results we have been taught to. Are Nigerians selfish people and are we interested in the goods of our immediate environment or are we interested in the good of the country? E-&-S: What about individualism and collectivism? E. Ohu: I would say we are more collectivists than individualists because we think more in terms of community as the family matters a lot and we act more as a group. But outside that group, people are more interested in solving their immediate needs. In contrast with Americans who put flags on their vehicles, I don’t think Nigerians would do so because most of them think « nobody is looking out for my immediate needs, I have to do it by myself ». It may explain why we don’t have the sense of belonging to our country and why we are not that proud yet for our country. But globally, we remain collectivists because of the family, because every child is the child of every woman. If I am hungry, I will go to the neighbour and he will give me food. We look out for one another. We are collectivists because we are concerned with our family when we go to work. E-&-S: How do Nigerians communicate with others? E.Ohu: If I take Hofstede's model, Nigeria is a more power-distance country but we are different from the way Chinese are power-distance as a way to save face. If the boss tells me : « feel free to correct me », I will do it. If the boss doesn’t tell me to feel free to correct him and if I feel that this boss can receive correction, I will tell him « sorry Sir, may I point to you something you did not do well ? ». Nigerians will do that if they see by the boss’s body language that he is open to correction, communication is hence very direct even if power-distance remains high. In fact, direct communication may turn to aggression because we lack refinement. We are direct communicators when our boss gives us permission to express freely but we may not be refined and lack respect to put it in a delicate way. Nigerians will express directly if they see the speaker is fair and really interested. Africans are more aware of the persons they are communicating with, not only the words, but we are aware of the whole person, his/her global individuality, with past, present, body language, worries... I am aware this person will choose a particular way of talking to me according to what he/she is. If Nigerians are proud people, they may also be arrogant, the same way the Nigerian teacher does not want to be questioned, the same way some bosses in Nigerian business do not want to be seen as having to learn something. We do not put people from different hierarchical positions together in the Nigerian setting as bosses are not supposed to learn. We put bosses with other bosses as a way to save face. E-&-S: Who do Nigerians consider as a good boss? E.Ohu:The boss takes the decisions and he also takes the blames.The typical Nigerian boss is afraid of delegating authority because he does not want to lose power, he is vulnerable and he feels protected by his power which, he thinks, belongs to him as his property. The ego is very important. So, it is the boss’s fault if the team member does not take responsibility and comes to him to solve his/her problems. The Nigerian boss has never really delegated authority. As a European manager, it is good to express the team member that you need and recognize him/her as a valuable member in the team, he/she will hence respond positively. Tell this person that you respect him/her as a person, as a family. E-&-S: If, for instance, a West-European manager had to start working in Nigeria, which advice could you give him/her which would facilitate his/her integration with Nigerian teams or with multicultural teams in Nigeria? E.Ohu: Nigeria is aware that there are different rates of development between Africa and Europe. They may blame others for their inferior position or they may blame themselves. In any case, they don’t believe other people will solve their problems at their place. Therefore, there is a sense of suspicion. They are welcoming people but they will be suspicious of your motives at first, you are to proof you are interested in them. They will wonder why you are here. As a European manager, you could tell Nigerians : « I respect your opinions, I am aware you have a power-distance culture but I will not make use of my power against you. » As a Nigerian, if I know my boss is not power-drunk, I would do anything for him. It does not remove the power-distance, he still remains my boss but he is humble, Nigerians appreciate that. The most loyal workers you will have are the ones you treat as equals, they will not take advantage. Intuitively, they will know there is a power-distance and they will be grateful to you for giving them a chance to level this unbalance not by promoting them, but by showing them respect. Be concerned with them as people having other roles outside the work place ; for instance, the typical Nigerian would ask another Nigerian : how is your family ? The West-European manager should show real interest in the family of his/her team members. If they are sincere, they will win a team member who will become dedicated. E-&-S: Isn't there any risk of manipulation? E.Ohu: They will know if you are pretending or not, if you are real or not. They are looking at your body language. For instance, you are asking about my child but you are looking at your phone. As a Nigerian, I will think, he is not really interested in my child because somebody told him it was good to ask about my child. E-&-S: Do Nigerians easily accept rules and discipline or do they prefer to infringe them? E.Ohu: In general, Nigerians do not like to obey rules, it is related to education, respect to others and civic responsibilities. As it is difficult to enforce rules, Nigerians tend to break them whenever they get a chance to do so. It is related to self-interest and to the State not taking care for our problems, so we have to solve them by ourselves. However, Nigerians can accept rules as a way to achieve their objectives or if somebody enforces the rule, they will not break it by fear of the consequences. E-&-S: Could you compare with other African countries? E.Ohu: When I travelled to Tanzania, I felt they were less educated than in Nigeria and in Kenya, but I think they obey rules much more. As an example, they have very narrow roads and they drive on the left. It happened many times to me that a driver realized, looking into his mirror, that he was driving too slow for me and that I wanted to overtake his car. With his hand he indicated to me that he had no plan to disturb me and that I could go ahead on his right. In that sense, Tanzanians have more civic sense than Nigerians but they are very slow: when Tanzanians say that you are most welcome in Tanzania and that they will arrange a meeting for you as soon as you arrive, make sure you have planned it before going there. When I went there, I spent two days before I could get my first meeting! They are not in a hurry and wonder why Nigerians are rushing for. In Nigeria, we may be more aggressive because we want to have things done. E-&-S: Which advice could you give to a manager who will work in a foreign country he/she has not yet been to? Learn the language of the country: : I love languages, I learned to speak Spanish and Italian before going to Spain and Italy. So I never felt like an outsider. I knew what they were saying and I wanted to be part of the conversation as from the beginning. So, I felt welcome. Very interesting and professional !